20 Facts About Lentils | Eat This! 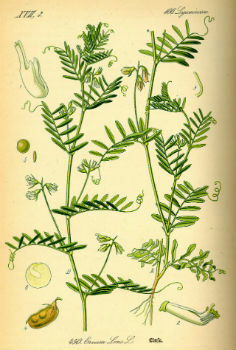 The lentil (Lens ensculenta) is a legume that grows in pods containing one or two lentil seeds. They are believed to have originated in central Asia. In the Old Testament, Esau gives up his birthright to Jacob in exchange for a bowl of lentil soup. Beluga lentils are black and one of the smallest varieties of lentils, having an appearance similar to caviar. French green lentils are small, delicate, and flavorful and hold their shape after cooking better than many other types of lentil. The optical lens is named after the Latin word for lentil, lens. Lentils and rice is a popular staple dish in many countries, with many variations depending on the region. In Egypt, one of the national dishes is kushari, a dish made of rice, brown lentils, chickpeas, pasta, garlic, salsa, and vinegar. In fact, many restaurants in Egypt serve nothing but kushari. 1 Comment on "20 Facts About Lentils"
Lentils are one of my 10 power foods. Great taste, sustained energy, and protein. Great post. Lens and lentils…never knew that.